As everybody knows it's Socktober again! These socks have been a field for experiments. 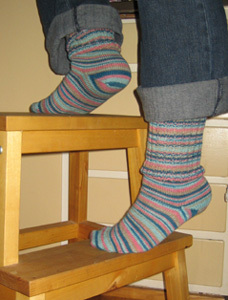 I usually knit Trekking on 2,25 mm needles but this time chose 2 mm for the feet and 2,5 for the upper part of the cuff. It felt odd to knit the ribbing on bigger needles - and it does not make too much sense I have to admit. Probably active cuff shaping would be wiser. Next time. Also, I knitted them cuff-down despite my fear of doing so when using a single skein. And it was really close in the end. With shaking hands I measured the left-overs: less than three metres. This pair is my first with short row heels AND toes. The grafting part of the toes was a delight. It is amzing how perfect aka seamless the socks look. I will definitely do a short row toe again. Not so sure about the heel, though. As you can see on the picture it does not fit perfectly. I like the ability to adjust the sock measurements to my instep when doing a heel flap. Concluding words: I love the rather unusual colour combination and I still love Trekking yarn. Fun! by Carola at 8:06 e.h. I like the colours in those socks -- very nice! You can adjust the fit of a short row heel ... somewhat ... by using more or fewer stitches for the heel and by leaving more or fewer unworked in the middle. They do seem to take a bit more playing around than the flap types. október 13, 2006 9:55 e.h.
What did you find to be the best reference on short row toes? I'd like to try them out one of these days. október 16, 2006 10:21 f.h. I agree about the short row heel, I was not too impressed myself. I however am really interested in trying a short row toe. I think it will be the answer to all my problems with toes. I'm glad to hear you liked it so much. It feeds my hope. október 17, 2006 5:39 f.h. I like the heel flap better than short row heel. I think it's too short for my heel, but that's a personal preference for me. How long did you make the socks? I've made socks out of Trekking and still had plenty of yarn and I wear a US10 shoe, although my cuff is usually 5-6 inches in length. In european size, I think my shoe size is a 42? I usually have plenty of yarn leftover? október 20, 2006 4:01 f.h.